The PolyScience Sous Vide Toolbox­­™ is the winner of the StarChefs.com International Chefs Congress Innovator Award. The PolyScience Sous Vide Toolbox­­™ guides you to a successful and food-safe sous vide cooking experience. 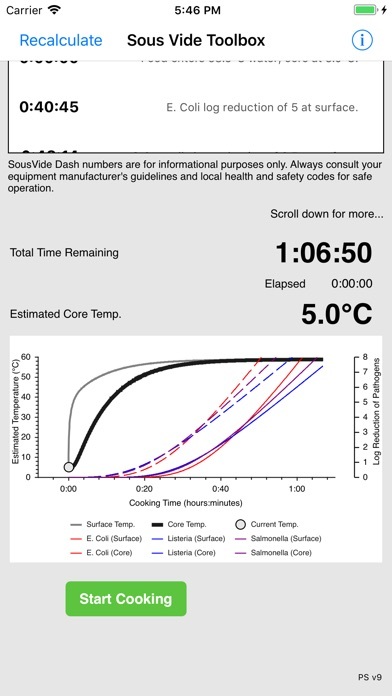 It helps you determine the optimal sous-vide cooking and re-heating time for a variety of foods. All data are plotted in graphs to show you the relationships between time, temperature, and pathogen reduction in your food. 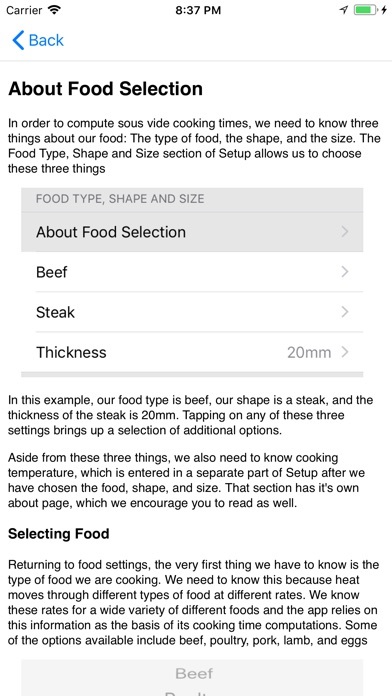 The Cooking Journal lists each event during the cooking process and explains if needed. Once the process is finished, you are notified via message and audible alarm. 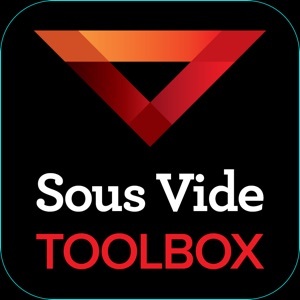 Instead of providing a limited number of combinations of foods, sizes, shapes and temperatures as found in time/temperature tables, the Sous Vide Toolbox provides a much wider combination of options - with just a few taps on your screen. The thermal conductivity (heat transfer) characteristics of protein are almost identical for every type of protein. 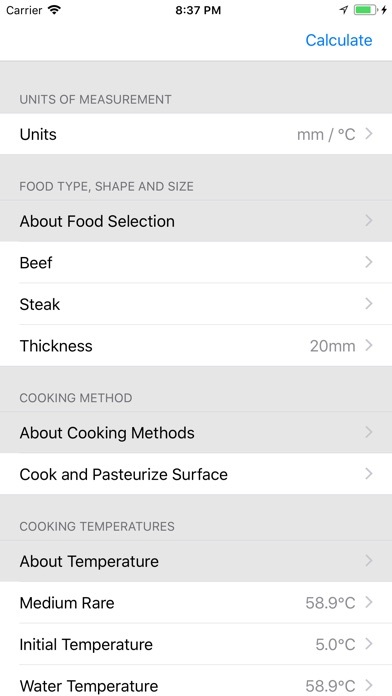 So rather than measuring how long it takes to cook food at different thicknesses, we can use this value to calculate the time it takes at a given temperature and thickness for the item to reach core temperature and different levels of pasteurization. 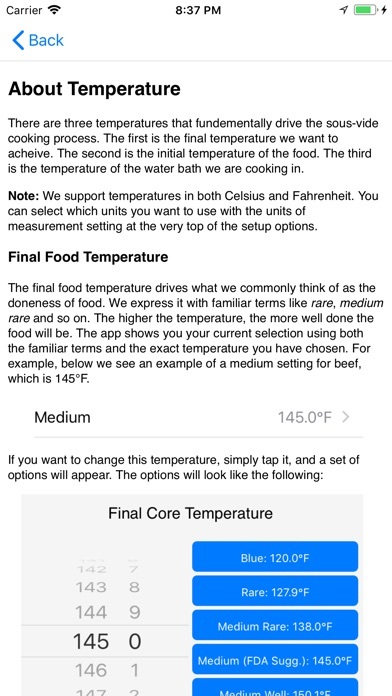 This takes out the guesswork of determining the correct cooking time at a certain temperature. 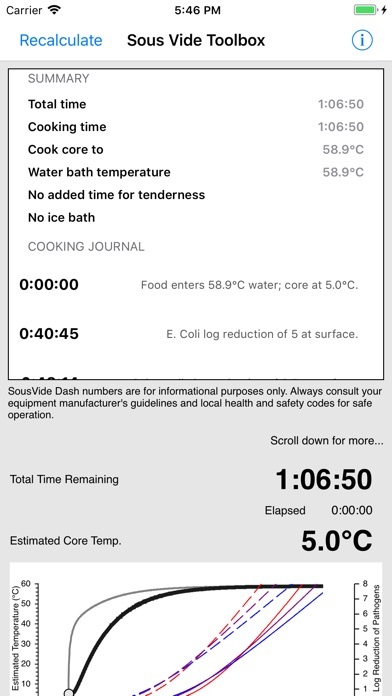 It also provides great guidance as to what level of pathogen reduction occurs at what time and whether your choice of temperature and time is considered safe.